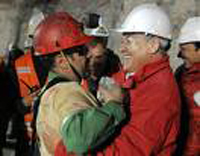 The Chilean mine rescue was good news. Thinking about it, however, we see parallels with the Good News, that is, the Christian Gospel. For the Christian Gospel is essentially a rescue operation – God’s Own rescue of perishing sinners. Four words will enable us to understand this. The words are Incarceration, Salvation, Reconciliation, and Transformation. John tells us in Revelation that the ones coming out of the great tribulation “washed their robes and made them white in the blood of the Lamb.” The Lamb’s blood made the robes white? 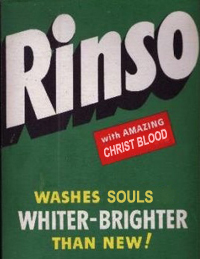 What makes the blood of Jesus a cleansing blood and not a staining blood? As time progresses if we live long enough we lose siblings, friends and spouses ultimately to death. It is a trail of leaving behind and losing what was once most dear.... For these three women there was a special bond that only those who have endured great suffering together can have. As it is easier to make a ball or safe call, so it is easier to stand down and avoid confronting error. Courage is a rare and wonderful quality, one which may cost us dearly. We see in the pages of the New Testament the price Jesus paid for His obedience to the Father. He was attacked by many, scorned and rejected, and ultimately went to the cross...Paul took stands for the Gospel that earned him enemies and a stressful life...John was opposed by the Roman authorities and was forced into exile, yet he never ceased to speak out against error. Christians in whatever era are called to do the same. And it takes courage to do so. 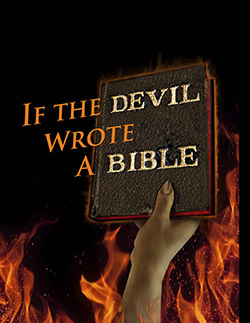 These things are written … John’s Gospel is in a category all of its own amongst human literature. John’s written portrait of the Saviour Whom he knew and loved so well is truly beyond compare. The only way of getting to know his Friend and Saviour is to read his Gospel and make its words part of our mind, thinking and very being. A 16 year old posted on Facebook that she thought her job was boring. She was called into her manager's office and handed a letter that cited her Facebook comments as the reason for dismissal... President Obama, in a September 2009 televised address to American schools, advised them to "be careful what you post on Facebook. Whatever you do, it will be pulled up later in your life." There is a powerful realm beyond the material; it is the supernatural. But not all supernatural spiritual power is godly.Those who are acquainted with various spiritualities know there is such power, and acquiring it is the moving force behind ancient and modern occult practices....The purpose of this essay is to sound a call for critical thinking. Unhappily, an obsessive hunger for supernatural power will not be of benefit in the long run. It may instead prove to be overwhelming, compulsive, disappointing, besides being spiritually and emotionally dangerous. We want the world to be just but it is not. God reserves the right to define what is good and what is just in our lives. This is the crisis of faith— to look honestly at the world’s condition and at the condition of our own lives and reconcile it to what we are told of the character of God. Today, there are millions of Christians throughout the world. Modern technology has given us the means of reaching multitudes for Jesus. Yet every year the percentage of the world's population that has heard the gospel decreases.